First of all, I found Insidious to be genuinely creepy. There were countless times when I jumped in shock, and for nearly the entire film I felt on edge. Horror buffs will be hard pressed to find a scarier film released this year. While evidently drawing from a bunch of established horror classics, notably The Shining, The Exorcist and Poltergeist, the family in trauma from the inexplicable and possessive supernatural elements idea also resembles the more recent examples like The Orphanage (often frightening) and Paranormal Activity (a film I found to be overrated, and not nearly as enjoyable as this). From writer Leigh Whannell and director James Wan (the pairing responsible for starting the Saw franchise and the only awesome film in the series) comes this low-budget but chillingly effective thriller. After a great title opening, and a wonderful build-up of atmosphere, it is unfortunate that Insidious loses its way in the second half. The scares are still very present, though the films minute budget becomes exposed and all thought, reasoning and sense is lost. Renai and Josh Lambert (Rose Byrne and Patrick Wilson) have just moved into a new home with their three children. One afternoon not long after they have settled in, Dalton (Ty Simpkins) is playing and hears some strange noises in the attic. After finding the attic door ajar, he investigates. While trying to turn on a light, he slips on an old and broken ladder and falls hard. It is hinted that something supernatural is lurking in the attic, as Dalton is affected by something he sees. That night his parents tuck him into bed assured that his carelessness had simply left him shaken from the fall. The next morning though, Josh finds his son immobile and unconscious in his bed, with doctors later claiming they could not explain his mysterious coma-like state. Three months later, with Dalton still in the coma, Renai and Josh decide to bring him home and care for him there. Over the next few days Renai begins to notice that there is something not quite right about their house. She hears hoarse whispering through the baby monitor and spots a figure outside of the baby's room that night. She is then nearly attacked by another figure in her bedroom. Unable to explain the ever-worsing events but to accommodate Renai's hysteria, Josh agrees to move home. This change has no bearing on their happiness whatsoever, as the haunts return almost immediately. While it seemed like Renai would become the central character, haunted by these figures that no-one else sees, she finds a sensitive supporter in Josh's mother, Lorraine (Barbara Hershey), who had experienced a vivid dream after visiting with Dalton and sensed that he was in danger. She calls in her friend Elise (Lin Shaye), an 'expert' in the field of spiritual possession and such. Elise reveals that Dalton has the ability to 'astral project'. This means that he can wander around the parallel spirit world (the 'Further') and interact with lost souls and demons. He accomplishes this in his sleep, which he believes are merely dreams. This ability has also attracted a powerful flame-faced demon which has drawn Dalton into this realm in the hopes that it can take over his physical body for evil purposes. This demon, and other possessive ghouls are what are terrorising the Lambert's for access to Dalton's body. While Josh is typically the rationale male who doesn't believe any of the supernatural business, he becomes essential in the latter half to ending their trauma. Josh, like his son, had the ability to astral project as a child and had been traumatised by an old woman (who used to lurk behind Josh in photographs). Elise instructs Josh use his abilities, enter the 'Further' and free Dalton's lost soul. It doesn't really lock down one type of horror, but combines many. Is it a film about a haunted house, or a possessive demon? While the cliches abound in the screenplay, James Wan has done a masterful job of building a really spooky atmosphere from the get-go and utilising the pulse-pounding score. Insidious is good enough to firmly stand on its own. While many have criticised that the film is visually unappealing, I quite liked the washed-out look. I also thought the use of lighting was fantastic, and each of the houses used in the film, with their staircases and long, dark hallways, were perfect settings. Working with good old fashioned horror techniques and relying on building suspense, it doesn't need the endless amount of gore that many horror films choose to indulge in. But through tricks of light, innovative camera movements and quick editing, Wan manages to produce a very effective array of jump scares. You will often see the scares coming, but they still catch you out. It takes the time to build the atmosphere, introduce the characters and mislead the audience. The first half of the film is fantastic, but there are moments in the second half that are downright cheesy. It raises ideas about death and the afterlife, and a connection between our souls and our control over them when we dream, but it never tackles one of these themes very well. Apparently people with the ability to astral project can enter dream states and help trapped others, and while in this state, they become vulnerable to possessive spirits. It becomes a little senseless, and some dodgy visual effects at the end aren't too hot either. The gimmicky conclusion is typical of modern horror films too. The inclusion of the comic relief from the ghost-hunters (played by screenwriter Whannell and Angus Sampson) also felt very out-of-place. 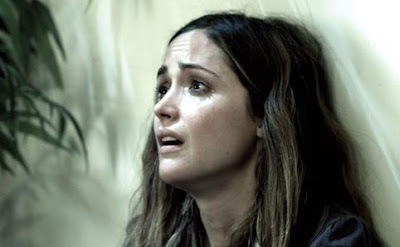 In horror films usually the performances aren't the strongest feature, but those delivered by Rose Byrne and Patrick Wilson are very good. They each give it their all and are genuinely convincing. Barbara Hershey also provides strong support. 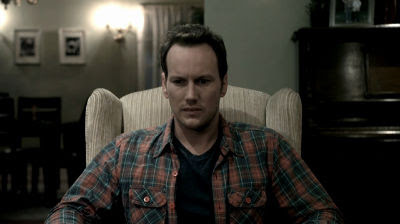 Despite its flaws I enjoyed nearly every moment of Insidious. Above all else, it is genuinely scary, which I think is enough to make it worthwhile. I got to a preview screening of this last Monday - loved it! That said, Wan occasionally has a tenancy to push a concept a little too far into the ridiculous (the grand unveiling of the red demon to name just one example) but at the same time I thought the way in which he handled the suspense, the scares and his control of the movie ultimately saved it from falling victim to its minor flaws. One of the best horrors of this year by far. This makes me sad .... I despised this film. I found none of it to be scary - and almost all of it laughable. Still, well written review Andy. @ Sam B - I agree, I think the first half was brilliant. Utilising old fashioned horror techniques and effective jump scares, while taking the time to build the atmosphere. It all worked. The second half (from when Leigh Whannell and Angus Sampson arrive) isn't nearly as good. It draws from multiple horror films, and tries to combine too much. It just becomes a little misdirected and senseless. Still, I thought it was pretty scary, and surely one of the better horror films of the year. Hey, cant wait for Troll Hunters at the SFF. @ Sam F - I thought it was genuinely scary, and there wasn't a moment I didn't enjoy. Sure, it wasn't perfect, but I liked most of it. I had a look at your review. You raise some good points. I didn't mind the washed-out visuals, though. I thought it effectively enhanced the atmosphere.